Happy mid-March! May your Saint Paddy's day tomorrow be great, glorious and green. Spring is springing here in Arizona. The telltale sign of spring is the budding of the trees. At lower elevations, all the deciduous trees have been fully leafed out for quite some time. Leaves appear very slowly up here at 3500 feet--so we all eagerly await the appearance of real buds and, Buddy, then buds are for you. The Big Storm now appears to be even bigger in scope and size than previously progged. We fully expect to go from deep dust to a winter wonderland by Monday morning. The snow level could be as low as 2500 feet. Naturally, this time of year such storms move out as fast as they arrive and spring will be back on stage no later than Wednesday next week. 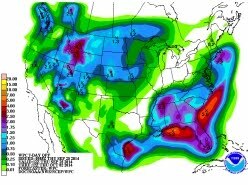 The one to two inches of rainfall we are expecting will only serve to turbocharge the arrival of spring. It's an exciting time of annual renewal. We are fortunate to be able to enjoy two springs each year--one here and one in Idaho. The trees are barely beginning to bud in late April when we arrive back there. Speaking of Idaho, they are really getting pounded by this giant storm. A lot of homes are being flooded today. No, they aren't being flooded by rising streams. Quite the contrary--rainfall on snow surrounding Northern Fremont County homes is sending the snow melt directly into those homes as the water has noplace else to go. Luckily, there was (is) no snow pack in Idaho Falls and currently there is no snow sitting around our house there. So, whatever rain falls will simply run off as usual and not flood our basement. We definitely dodged a bullet on that one! Yesterday was our third trip to Prescott in recent weeks. We received our new hearing aids (AKA: ears) on March 8th and took them back for a followup consultation yesterday. The ears are working well and we are happy with them. Strangely, we can say that it was a pleasure to spend $2000 to acquire them. We should have bought them a long time ago. The ears have shortcomings--all such devices do. However, they do some things extremely well and are definitely worth the money. The trick now is going to be to get in the habit of wearing them most of the time. We are barely blogging these days. That's pretty obvious. For the better part of two years--all of 2010 and 2011--we tried to blog an average of once a day. We've put up over 1185 blog post here in January 1st, 2010. That's well in excess of an average of one a day. Ever since we had to go back to Indiana, our output has fallen off a cliff and we are barely blogging now. Blog readership sure reflects that fact. This week's statistical package shows our 19 stalwart LBRs checking in for a mere 90 seconds each day. Page views are way down, too. At the peak of this blog's readership, we were logging upwards of 40 unique visitors each day and their "hang time" on the blog often approached 4-5 minutes for each visit. First, we wish to thank and congratulate those 19 stalwart LBRs! We sure do appreciate you sticking by the blog through thick and thin. Obviously, we're into this blog for the long run. We have no idea when we will get back in the swing of things and resume daily blogging. But don't worry and don't fret, we WILL be blogging at a more frequent pace one of these days--hopefully soon. We've recently realized that the passing of our Mom and the subsequent events that followed have basically depleted our mental reserves and left us somewhat numbed. This condition has affected our enthusiasm for daily blogging. We suspect it's what is called "The Grieving Process." Grieving is a very personal thing and reflects itself differently in each of us. It is possible that no two people grieve the same. In our case, it's not like we are sitting around in the classic stupor of abject grief. Nope--far from it. We are very busy and happily engaged in a lot of fun stuff--stuff that keeps us active, involved and amply rewarded with positive feedback and the happy smiles of our Dear Friends here. We enjoy our camp fires and daily routines just as much as ever and are as cheerful and positive as always. However, there's just something missing--that little extra spark, I guess you could call it, and this blog has been neglected as a result. That's why the blog barely has a pulse these days. In the meantime, we suggest you all visit Wayne Ranney's blog. Wayne has truly hit his stride as a honest, world-class blogger right now. His blog is so incredibly wonderful and exciting and highlights just why a blog can do stuff that Facebook and Twitter will NEVER be able to equal. Wayne's blog is dazzling in its detail and thoughtfulness. Also, if you want a really uplifting blog, be sure to visit Kirsty's Momedy blog. we love Kirsty's blog--her words bring joy and happiness to our heart. She is an inspiration and a role model for us as well. We sure hope someday we can blog as well as Kirsty! Thanks Wayne & Kirsty for bringing such happiness into our lives. Thanks for the mention of my blog postings! it's ok...take a break, we'll be here when you get back into it..do whatcha gotta do.